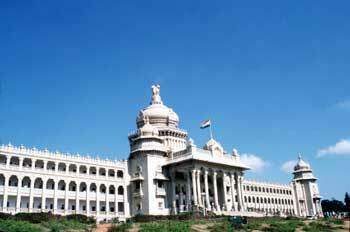 Bangalore, presently known as Bengaluru, is the capital city of Karnataka. It is a beautiful, planned city and is also known as the ‘Garden City of India’ for its gardens and parks. Kempe Gowda, a feudal lord serving under the Vijayanagar kings, is said to be the founder of Bangalore. He started by building a mud fort in Bangalore and inside it founded the towns of Balepet, cottonpet and chickpet. Later on, the four watch towers were added by his son. The place went on expanding under each ruler. The city however remained under the Mysore Kingdom till independence with transitory occupation by the Marathas, the Mughals and the British. The influence of all these rulers can be found in the buildings, monuments, temples, parks and market places. Bangalore started growing after it became the capital of Karnataka. Today it is a well known hub of India’s IT (information technology) sector and high quality educational institutes. The best time to visit Bangalore is from October to February when the parks are in full bloom. However, since the city experiences a pleasant climate throughout the year, one can visit the place any time of the year. Lal Bagh spreads over 240 acres and is home to over 1000 species of flora. This park was the creation of the ruler of Bangalore Hyder Ali. The huge and lovely botanical garden surrounds one of the towers erected by the founder of Bangalore, Kempe Gowad1. There is also a glass house with some rare species of flora. There is also the Lal Bagh Rock, dating back to 3000 million years that is even before the Jurassic Age! Lal Bagh is a popular tourist attraction. Located 45Km. from Bangaluru, the Bhoga Nandeeshwara temple stands on the Nandi hills. This temple is dedicated the sacred bull, Nandi. A magnificent stone statue, about 15 ft. tall and 20ft. long is installed in the temple. Every year during Nov/Dec. a ground nut fair is held near the temple. There are a number of choices available for dinning in Bangalore. There are small self-service restaurants serving quality food for the budget traveler. There are also luxury restaurants to meet the needs of the higher end travelers. The Udupi chain is good for authentic south Indian cuisine. Chinese hut, Mandaria Room, Memories of China, and the Red pepper are among the best Chinese restaurants in Bangalore. And for the continental food one can opt for La casa, Lotus, Orchids and Roses, Orange Country and Windsor Grill.